I was finally afforded the opportunity to eat at Zapoteca recently, due to a double-date night with Ben and Laura and a sweet Living Social deal (paid $25 to get $50 worth of food). We strolled down to their Fore Street location after imbibing a bit at Ben and Laura’s casa. The valet attendant opened the door for us. I was glad we walked, because $6 valet parking hardly seemed like a good deal to me. Being the cheapskate that I am I probably would have driven circles causing us to miss our reservation instead. But I digress, because the minute we walked in the lively atmosphere took over. Bartenders were shaking up every kind of margarita imaginable. The smells from the kitchen were as spicy as the name of the restaurant itself rolling off my tongue. Zapoteca is no place to eschew in the vibrant Portland food scene. We arrived promptly at eight o’clock for our reservation. We were told our table would be a few minutes, so we cozied up next to the bar to check out the cocktail menu. Just as we were about to order we were directed to our table through the back open kitchen area. I loved the concept and I could see everyone working and garnishing the plates. It was a perfectly beautiful, clean, and organized space. When we were seated our waitress came right over to take our drink order. I decided on the Blood Orange Margarita, Ben got the Guava Margarita, Laura decided on the Pomegranate Margarita, and Mark (not one to drink Tequila) tried the La Rumba—a drink made with rum that was reminiscent of a mojito. We also put in for the Ceviche Trio, which consisted of one made with whitefish in a tangy lime juice with jalapeños; one made with huge chunks of lobster marinating in a grapefruit salsa; one shrimp and calamari ceviche made with lime, orange and chili habanero. Each came served in a martini glasses with tortilla chips on the side. I thought the whitefish one was by far the best, but the lobster ceviche was a huge hit with the rest of the gang. They were all delicious, but there weren’t nearly enough tortillas for four people and the large amount of ceviche. We also had the steamed mussels with chorizo. They were in a rich sauce, and while the mussels weren’t of the freshest quality, the sauce made up for it. It was then time to order our entrées. Laura decided to go with the Enchilada Suizas de Pollo. This was a beautiful plate of wood roasted enchiladas with local Jack cheese and topped with fire-roasted tomatilla sauce, black beans and guajillo salad. She loved the dish, but thought it needed some extra spice, so she sent our waitress for some house made ghost pepper hot sauce. After tasting it, she claimed it wasn’t even that hot (though we all know ghost peppers are the hottest in the world). Her maiden name is Hernandez, so she joked that she was born to handle the heat. My background is French, so I didn’t even attempt that madness. Ben ordered the Carnitas De Puerco. Those were made with locally raised pork shoulder and topped with a tomato chile sauce with black beans, salad, and grilled tortillas on the side. That block of pork looked absolutely amazing. I snuck a taste while Ben ate away. He was three-quarters of the way done before he realized he was eating it without the tortillas. He didn’t seem to mind, as it was perfect with, or without, them. My husband, ever the beef lover, just had to try the Ancho Filete Con Champiñones. Locally grass-fed beef (his main weakness in life), chipotle sauce, and queso blanco harkened him to a gastronomic state of zen rarely able to be achieved in such a boisterous atmosphere. Topped off with some “perfectly cooked” asparagus and garlic cheddar chipotle mashed potatoes and you had one happy man. I was having the absolute worst time deciding what to have. So many items just sounded too good to pass up, but I finally decided on the Relleno De Puerco. It was an absolutely amazing fire-roasted poblano pepper filled with chorizo and pork, then topped with queso fresco and tomato habanero sauce with black beans on the side. It was absolutely wonderful. The habanero sauce on top was quite spicy, but nothing a margarita or two couldn’t solve. The roasted pepper was cooked to perfection and I was very impressed with the quality of all the ingredients. I would definitely eat the dish again and would recommend it to anyone who has an obsession with relleno, because I have a semi-serious one and it was more than I even hoped it would be. I don’t think Zapoteca is trying to give the impression that it’s authentic Mexican food, but the inspiration is quite fantastic. I think for an upscale Latin American food experience it hits a home run. They have a wide variety of menu choices (only one vegetarian option though…) and their drink menu is inventive to boot. The only complaint I have is that many of the dishes were quite salty (not to the immediate taste, but an after effect was felt later that night and next day). I simply could not drink enough water to quench my thirst for the next 24-hours. It was overall an excellent dining experience in Portland and I really just can’t wait to go back and taste some more of their menu items—I’m definitely thinking enchiladas next time. 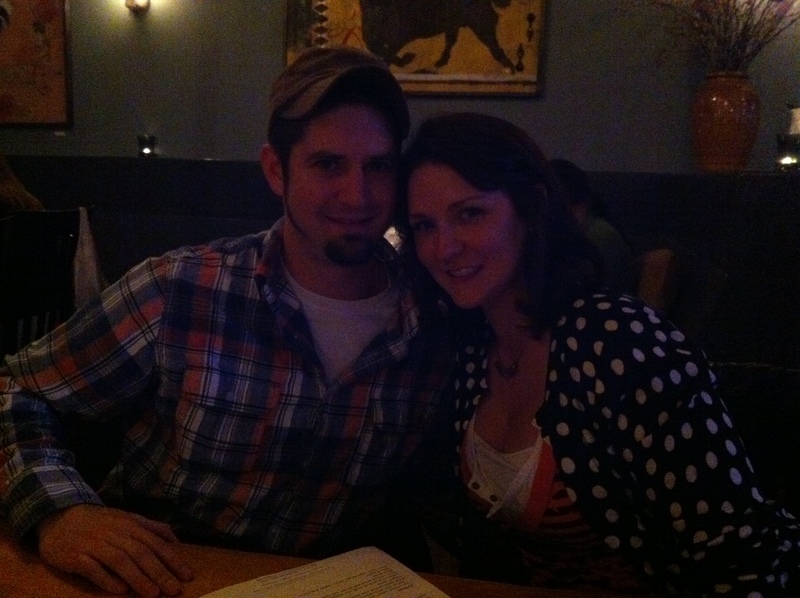 A few weeks ago we decided to go out and eat with our dear friends, Jen and Kyle, on a Saturday night. It was a last-minute whim, but we decided to try somewhere we hadn’t eaten at before. Since none of us are native Mainers, let alone, native Portlanders, we are all still relatively new to the restaurant scene here (we’ve only been here since 2010). We were all discussing where we should go when, low and behold, it was discovered that none of us had eaten at Local 188 for dinner! Surely this was a crime! A nano second later we were in our cars driving across town to try to score a table at 7:30 on a Saturday night. We got in eventually, but we definitely should have made a reservation beforehand. We started the night with some drinks while waiting for a table. The cocktail menu at Local is unpretentiously unique. None of their specialty drinks are anything I have ever seen on a menu elsewhere. I decided to try something my blogger friend, Laura of Fore Front Fashion, recommended–Basil Lemonade. I wasn’t sure what to expect, but after my first sip I realized how dangerous their cocktails are. They taste so smooth, it’s almost as if there isn’t any alcohol in them, but be forewarned, there definitely is. Jen started with a wonderful White Lotus, Mark had a Dropkick Murphy, and Kyle had a beer. Everyone was quite pleased with their selection, and Kyle commented that the beer list was large and diverse. After a round, we were seated. The restaurant itself is dimly lit at night, which creates a fantastic ambiance. It’s not a quiet place, as the kitchen is open and most of the people dining there were in large parties. A birthday was being celebrated next to us and the laughter that filled the air made it feel more like we were dining in someone’s large dining room. All in all, a welcoming establishment. Our waitress came over to our hungry crowd and asked if we had questions about the menu. With everything sounding so amazing of course we would have about a million questions for her! 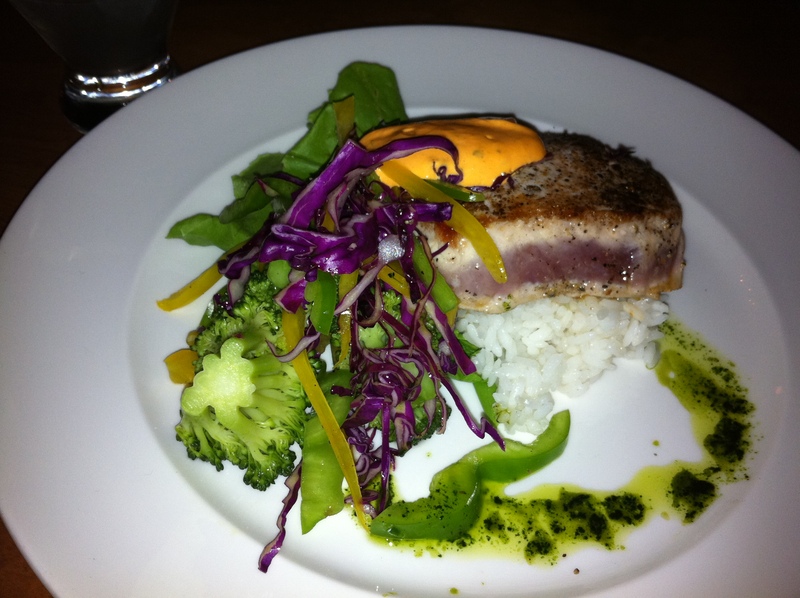 After some time of explaining the specials and some particular items on the menu that we were eyeing, Jen took her time to debate whether or not to get the night’s special–Ahi Tuna (note: she is a lover of Ahi and orders it everywhere she goes. She cannot turn it down, even if she thinks she might want something else, the pull is too strong). After consulting with our waitress for a few minutes over that, she decided to take the plunge. Mark ordered the Steak Tartare appetizer and the oven roasted white fish for an entrée. 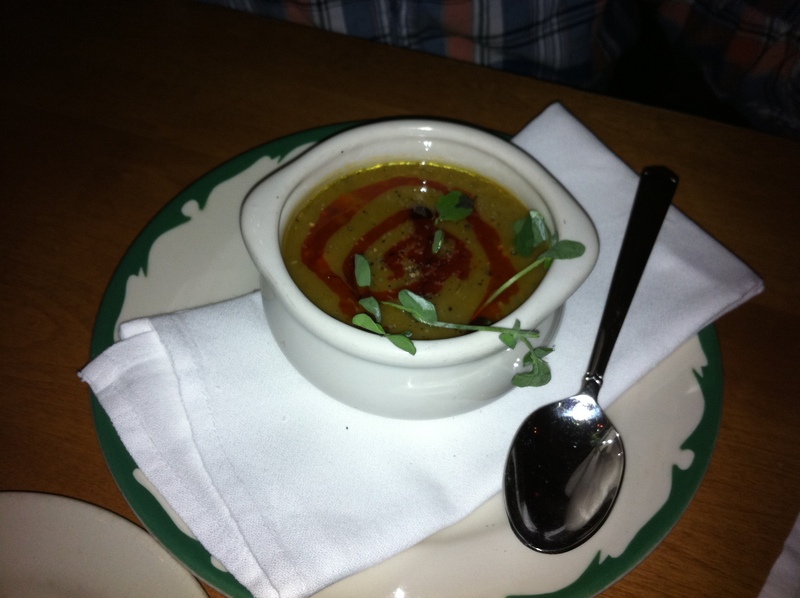 Kyle ordered the Split Pea Soup with Chipotle Oil (a special that evening) as an appetizer and the lamb shank entrée. I opted for the chicken livers appetizer (because like Jen I also have obsessions, mine is with liver. Yummy, earthy liver! Oh yeah, and little chicken livers are my absolute favorite. I can’t turn them down, ever. And then the seafood paella for an entrée. 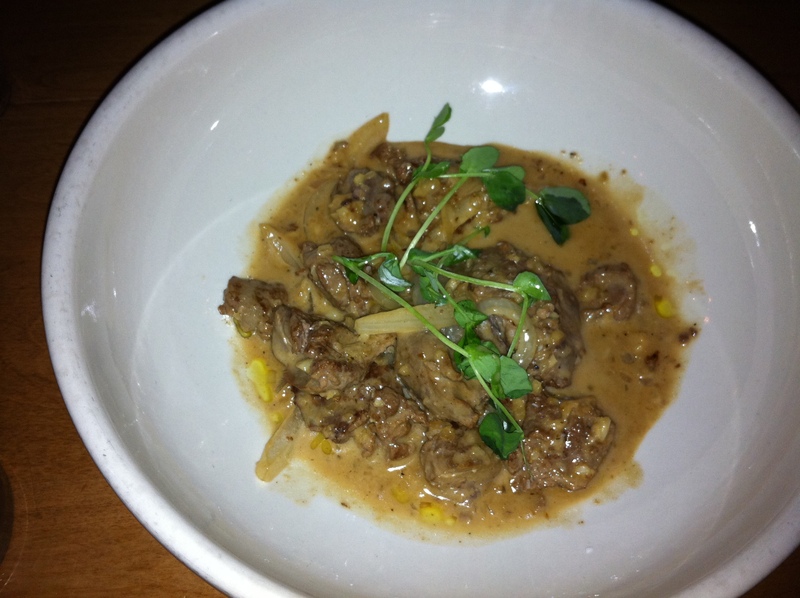 The chicken livers were the best I have ever had anywhere, and I order liver anytime I see it on a menu. Jen and Kyle had never had liver before and were very impressed by the dish. Kyle’s Split Pea Soup was also over the top. The chipotle oil drizzle added a hint of spice that complemented the dish in a way none of us thought was possible, it was the best vegetable based soup I have ever put in my mouth. 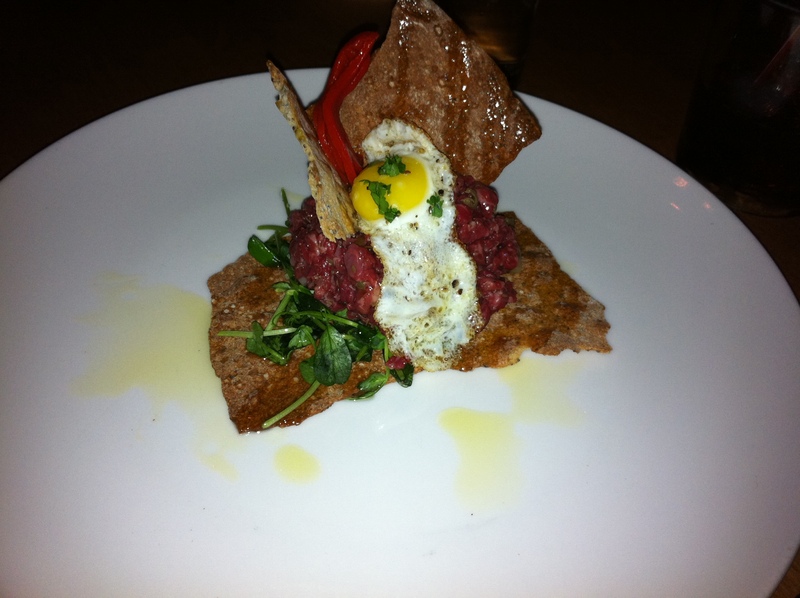 And then Mark’s tartare–I don’t even know where to start! So many people are afraid of raw meat dishes, but this beef was perfectly fresh and the seasoning on it was just wonderful. I have had tartare at Hugo’s that didn’t measure up to the quality of this beef! Then after we licked our appetizer plates clean, even more goodness started arriving at our table. I felt like I was at a feast for royalty. Jen raved about her Ahi, saying she thinks it was one of the top five preparations of the dish she had ever had in her life. Kyle’s lamb was so tender and juicy it was falling off the bone and onto everyone’s fork (I hope he got at least three bites of his own meal). 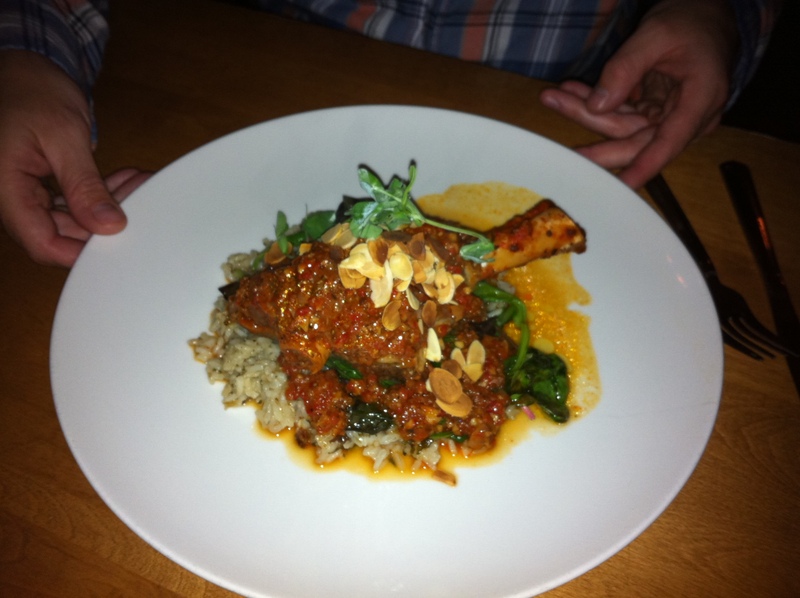 Mark’s white fish was good, but it was definitely the most lackluster of all the dishes, but was in no way inedible. 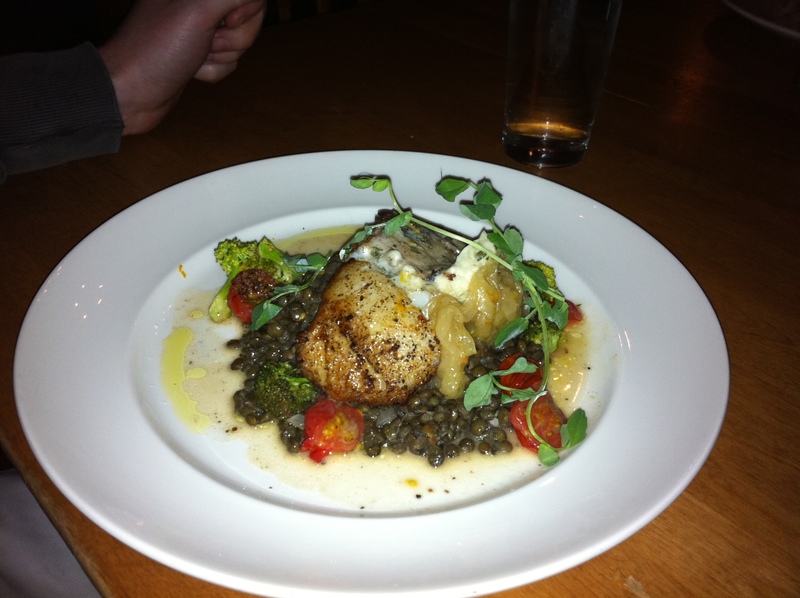 The fish was cooked perfectly and the lentils that accompanied it were good, it was just overall an “okay” dish in comparison to the other entrées at the table. My seafood paella was nothing short of fresh, fresh, fresh! The mussels were tasty, the shrimp in the dish was cooked just right (sometimes they can be rubbery in paella from overcooking), and the clams seemed as if they were just pulled the bottom of the bay.